L'Afrique divisee en ses Principaux Etats. 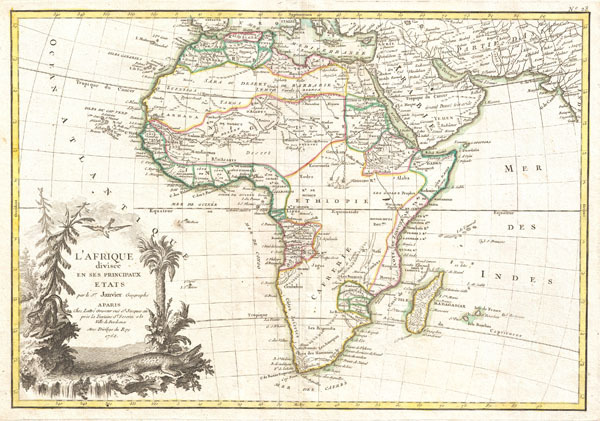 A beautiful example of Jean Janvier's 1762 map of Africa. Covers the entire continent as well as the Island of Madagascar and adjacent parts of Persia and Arabia. Divided into various regions with color-coding according to the colonial power active in the region. Course of the Nile follows the Ptolemaic two lake theory. Shows the Mountains of the Moon just south of the Ptolemaic lakes. In southeastern Africa there is a long lake speculatively drawn in and labeled L. Maram, but which most likely represents an embryonic Lake Tanganyika. Much of central Africa is blank, suggesting the profound lack of knowledge of the interior. Nonetheless, several major river systems, including the Niger, the Congo, and parts of the Nile to show indications of active exploration. Names numerous African kingdoms and tribal groups throughout, though admittedly few correspond with the groups we know today. In the lower left hand quadrant there is an elaborate decorative title cartouche exhibiting a Nile crocodile, a leopard, vegetation, a bird and a waterfall - possibly one of the Nile cataracts. Drawn by J. Janvier for issue as plate no. 23 in Jean Lattre's 1775 issue of the Atlas Moderne. Rumsey 2612.061. Phillips (Atlases) 664. National Maritime Museum, 215.